What's it like being Kong on Skull Island? We're not really sure. On the one hand, you're the king of the island, and a real formidable force. But on the other hand, you're the last of your kind, and you have to cohabitate with all those nasty skullcrawlers. Ah, who are we kidding, everyone knows that being Kong would be totally awesome! This deluxe kid's costume is a costume shirt and mask, done up with all the style that we loved from the movie. Faux fur shoulders and sleeves on the top contrast with polyester printed details, padded pectoral muscles, and printed fur details and a movie logo are printed along the waist. 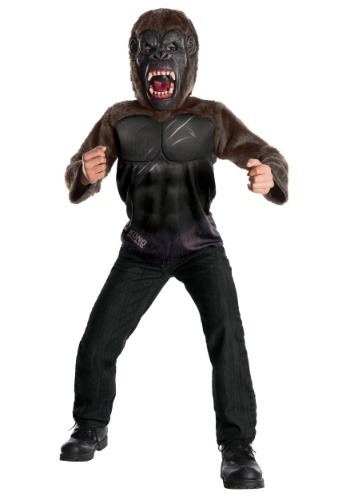 The mask completes the deal with a raging Kong face captured in latex, and faux fur surrounding the head. With this set up he can take on some skullcrawlers in your backyard, or use it to make the whole Halloween experience extra awesome. With this officially licensed look, we're sure whenever he wears it it's going to be on like Kong!